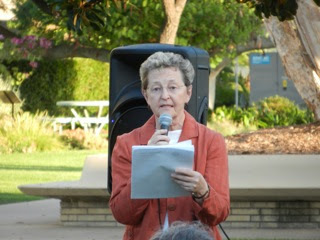 The Costa Mesa Finance Advisory Committee will meet 3:30 next Tuesday, July 30, 2013 in Conference Room 1A at City Hall. For those of you with nothing else to do in your lives in the middle of the afternoon, you may find the agenda for that meeting, HERE, worth a look. As you can see, there are NO agenda staff reports for you to consider on the individual items. That's disappointing because reviewing what is planned to be discussed with more details available may encourage more residents to involve themselves in the process. It would be great for interested parties to have a chance to preview any or all of those very relevant subjects to determine if they wish to attend the meeting to hear the discussion by this appointed committee. The proceedings are not broadcast live nor video taped for later viewing, so the only way you'll know what happened is by attending - or by waiting for someone else to tell you. I wonder if the committee will actually consider possible changes to the Business License Tax structure to generate more revenue for the city, and, if so, what will it look like? I wonder what their position as a group and as individuals will be on the subject of prepaying our PERS obligation. 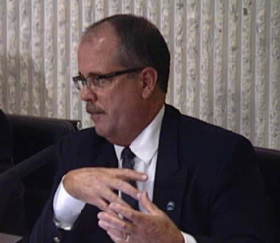 This committee is stacked with folks sympathetic to the current council majority, and Mayor Jim Righeimer has told us many times that he's "not going to send one spare dime to CalPERS". I wonder what kind of other Revenue Sources the committee will be discussing? Will they consider a parcel tax, a municipal sales tax or...? Under New Business they will be provided a report on Chandler Asset Management, the firm recently retained to help manage a large chunk of our municipal cash. They will also be given the Treasurer's Reports for both the City and Successor Agency for June. All of that sounds like pretty good stuff... guess I'll have to attend to hear what they have to say.. hope to see you there. 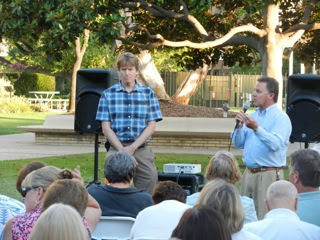 Thursday night the Costa Mesa Parks and Recreation Commission spent a lot of time hearing from the staff and ten members of the public on the issue of new entryways to the southern end of Fairview Park, HERE, before finally deciding to ask the staff to return to their August 22nd meeting with more information before taking a vote on the major issues. The biggest issue, as articulated by Chairman Byron de Arakal, is the fact that the parking area planned at the end of Pacific Avenue shows more than 40 parking spaces but the approved Fairview Park Master Plan only provides for ten at that site. He was unwilling to move the item forward until that discrepancy is resolved, so he asked the staff to consult with the Planning Department and Legal and bring back the result of that consultation. He implied that, if the proposed plan violates the master plan, he may ask to revise the master plan. Speakers were concerned about there not being a restroom at that location, citing the need because of the proposed tot lot adjacent to the parking area. They were also concerned about traffic on Pacific, which has insufficient sidewalks for the current traffic, much less the anticipated increase due to the additional parking. A few members of the public were concerned that the received notice late in the process, and that many of their neighbors may have just received it in their mail today. In addition to the issue of inconsistency with the Master Plan, the motion passed unanimously by the commission asked that both Site Plan A and Site Plan B be brought back with a plant palette, photos of proposed plants and hardscape and lighting specifications. de Arakal also asked for broader notification of the issue, and more time between the notification and the meeting, if it is possible within City policy to do so. It was clear that several members of the commission favored the plan as shown, so neighbors and others with opposing views should be prepared to make their pitches - again - next month. 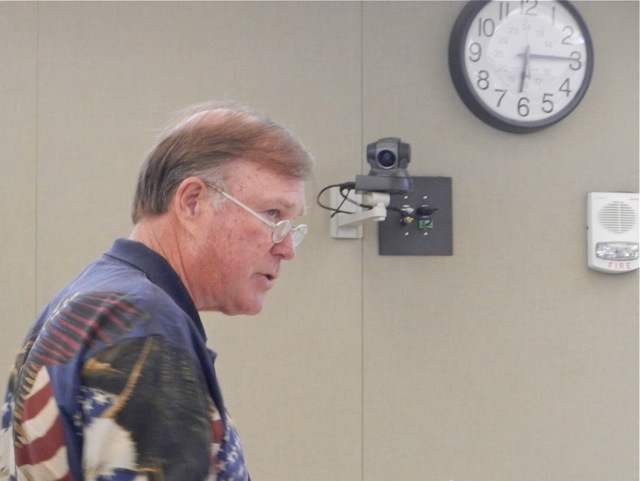 In other actions, the commission managed two tree removal requests and heard the issue - briefly - that involved the proposal for a performance audit for the Costa Mesa Country Club. According to Recreation Manager, the need for such an audit has existed for several years and the City Council requested this one to evaluate whether the city-owned facility is performing to contemporary standards and that it is serving the community well. One speaker expressed concern that residents and out-of-town visitors alike pay the same greens fees, feeling that outsiders should pay more. The City Council will select a vendor soon. During his comments at the end of the meeting de Arakal told the commission he had been working closely with CEO Tom Hatch, Lt. Mark Manley of the CMPD and others to come up with a plan to make the Volcom Skate Park a safe place for all once again. He expects there may be plans ready to put forward by their October meeting. Apparently this issue is not simply one of citing and/or arresting violators of the safety equipment requirement and using the park when it is supposed to be closed. At least the ball is rolling to find a solution to protect young skaters and to permit Park Rangers to do their jobs without being attacked. Commission Will Discuss Signs and Lights at Fairview Park Tonight! 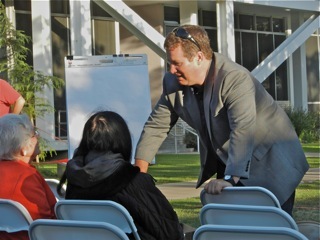 Tonight, beginning at 6:00 p.m. in City Council chambers, the Costa Mesa Parks and Recreation Commission will meet to discuss several items. I posted about this earlier, HERE, but really booted it when I ignored the item on the agenda involving a planned modification to Fairview Park! 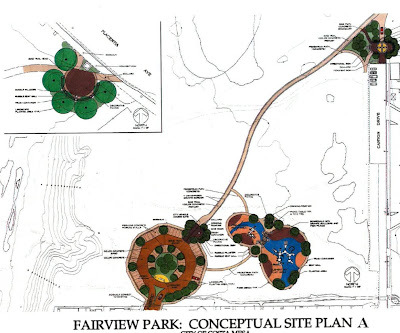 According to the staff report 9c titled "Fairview Park Entryway Concept Plans", the staff will ask the commission to approve conceptual designs for many new elements at Fairview Park, including parking lot lighting. You can read the staff report and see the exhibits HERE. For those in the community with strong feelings about Fairview Park, attention should be paid to this item. If you cannot attend the meeting in person, you can view it on CMTV, Channel 3 on Time Warner Cable and Channel 99 on ATT U-Verse, and see it live on streaming video at the city web site, too. 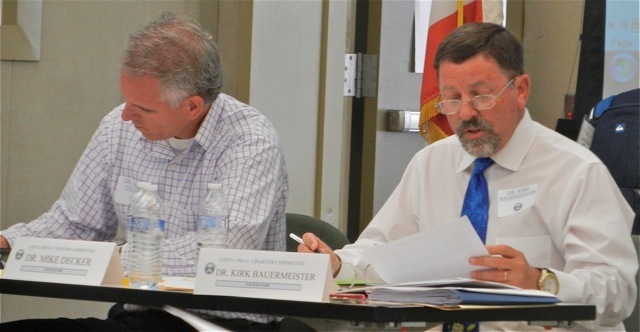 I apologize for not giving you more notice on this important issue - I was transfixed with the proposal for the performance audit of the Costa Mesa Country Club. Guess I'm not a multi-tasker. 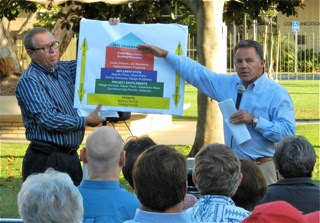 Wednesday night the Costa Mesa Charter Committee met again to tackle the task of creating a new "constitution" for the city. Progress was made, but came slowly. It was more than a little like watching sausage being made. The meeting began promptly with facilitators Kirk Bauermeister and Mike Decker moving swiftly to guide the group through the agenda. All agreed to look at their progress at 8:45 and decide whether to wrap it up then or extend the meeting. Public Comments saw five of the dozen or so people attending the meeting address the committee. 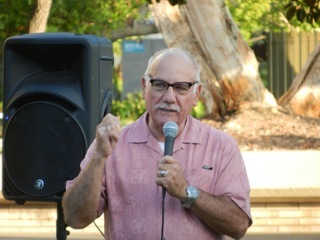 The first was Jim Adams, representing the Los Angeles/Orange County Building and Construction Trades, who spoke about the value of a highly skilled workforce, emphasizing Skill, Safety and Efficiency. 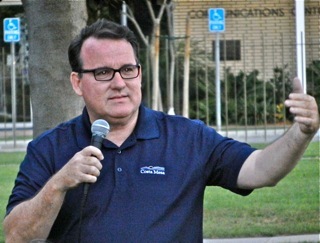 His organization represents 150,000 members in Southern California. He left a DVD for each of the members. 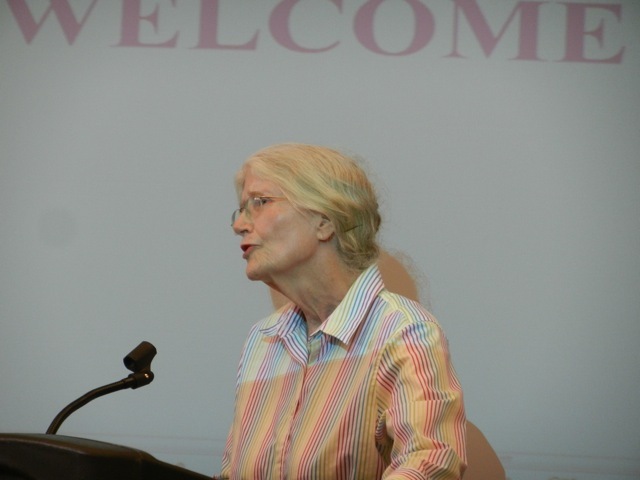 Resident Sheila Pacquin reminded the committee that, as they assess the different elements of a Charter, they don't really have to do anything if they feel that is the appropriate course of action. Mike Harmanos attempted to correct an error in the staff report and implied that the staff was letting them down by providing inaccurate information. Robin Leffler briefly asked what happened to the item that had been placed on the "Parking Lot" to be considered later. That issue was the "community needs assessment", which seemed to be a logical place to begin the deliberations. Although nobody answered her question, one might assume that since the decision has already been made for this group to create a charter for the city, a "needs assessment" is now unnecessary. Finally one grumpy old fella, who left a few minutes later, reminded the group that the council had charged them with creating a charter, so they should stop wasting time and get with it. The committee then wasted fifteen minutes again discussing "Tea Party Tom" Pollitt's request for an invocation at the beginning of the meetings. Part of the staff report included correspondence from the CEO's office that opined that if the committee wanted to have prayer it would require a formal change in council policy. After too much conversation the end result was that Pollitt was told to pursue it personally with CEO Tom Hatch, and not as a member purporting to represent the views of the committee. Since he kept muttering about not being able to exercise his First Amendment rights, I imagine he will do just that. We'll see. 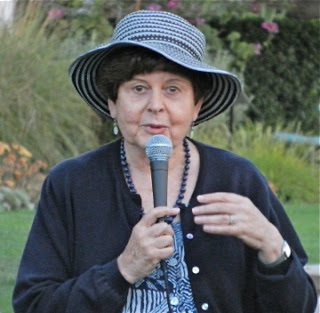 Following a brief discussion about the process to be followed - a couple members just wanted to dredge up Jim Righeimer's Charter and glue corrections to it to make it acceptable to the voters - lawyer Yolanda Summerhill led an hour-long discussion of the different types of Public Contracting environments that exist in California. At the previous meeting the committee agreed on their priorities and Public Contracting was at the top of the list. Costa Mesa, a General Law city, follows what is known as the Uniform Construction Cost Accounting Act (UCCAA), which streamlines the public contracting process. The objective was to provide information to the committee about how the city currently manages public contracts. Unfortunately, Director of Public Services Ernesto Munoz was not available for this meeting. He will be asked to be at the next one so he can provide some critical answers to important questions that will affect the committee's decision on this cornerstone issue. 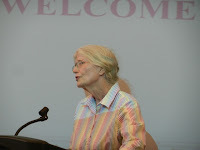 The discussion was cordial and most members were patient with the opinions of others. Since they didn't have enough information regarding the current process the discussion tackled the Transparency portion of their concerns. Based on what I heard, there was a rough consensus that the current methodology of managing public contracts using the UCCAA model seemed to be satisfactory. That view may change after they get more details on the current process at the next meeting. They did not finish the Transparency element Wednesday night, but hope to do so and move on to "Openness" at the next meeting. It's clear to me that, despite the fact that some members want the process to move more quickly and are willing to take shortcuts to accomplish that, this is going to be a long and sometimes painful process. Those preferring to find shortcuts represent the element on the committee that can be accurately described as supporters of Jim Righeimer's Failed Charter. It's going to be very interesting to watch this play out. As I said earlier, so far the participants seem willing, but not necessarily happy, to consider all views and to follow the guidance of the facilitators. Bauermeister gave them a homework assignment - to assess the various charters provided to them earlier for ideas for "transparency" and "openness" segments of a potential charter for the next meeting is August 14, 2013 at the Emergency Operations Center. Many of us occasionally get "to big for our britches" - some might say the word "occasionally" should be removed when referring to me, for example. It's easy to let our egos get in the way of accomplishment. That just seems to be one of the irrefutable laws of nature. Sometimes the old "humility" dog bites you in the fanny to help deflate that ego. 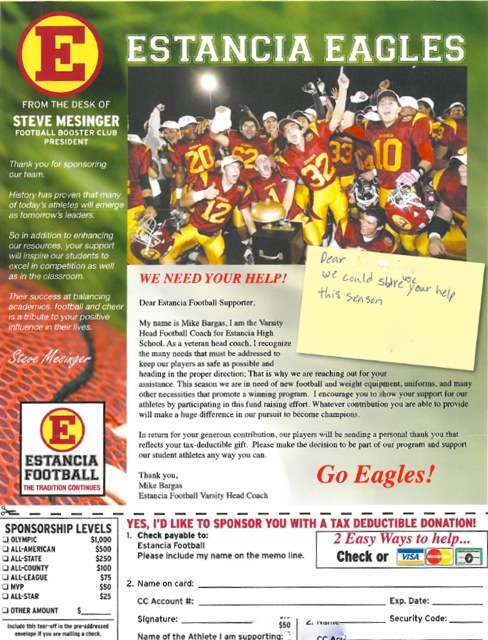 So, when a friend sent me the flyer he received from the Estancia High School Football Boosters earlier this week I couldn't help but think that Costa Mesa Mayor Pro Tem Steve Mensinger just experienced one of those ego-deflating events in his life. 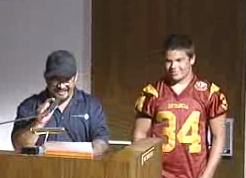 You see, Mensinger fancies himself "Mr. Football" in Costa Mesa. 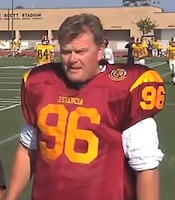 It seems almost impossible for him to hold forth on almost any subject without folding in a reference to Pop Warner or Estancia High School football. Not that there's anything wrong with that - necessarily. Heck, he's the president of the Estancia football boosters, for goodness sake! We've seen parents, coaches and players line up at speaker's podiums to sing his praises over the past couple years. Clearly, they all felt he had positively influenced their lives - at least, their football lives. Good for him. So, when you view the image of that flyer, below, I suspect you may find just the smallest hint of a smile form on your lips as you observe that the good folks in the booster organization, in presenting Mensinger's message on the left edge of the piece, somehow managed to misspell his name - twice! Yep, they left out the first "N" in the name at the top and also in the cursive "signature" at the bottom. 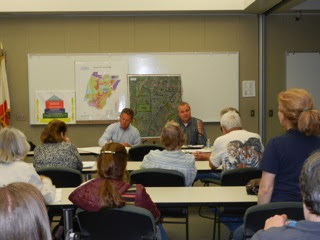 The General Plan Update Visioning meeting last night was a big success. While nearly 90 of your friends and neighbors listened intently and participated enthusiastically, a large covey of children gathered nearby on the lawn, created little cardboard "car seats" and patiently waited for the SpongeBob SquarePants movie to begin. The meeting was facilitated by new Director of Development Services/Deputy CEO Gary Armstrong - fresh off going through this process in his previous gig at San Benito County - and consultant Rick Zimmer of the firm Hogle-Ireland/MIG. Clearly, both men had been there before and moved the meeting along briskly. Following a brief introduction and explanation of the process for the evening, more than two dozen residents stepped up to express their views on what they'd like to see in the City over the next couple decades. 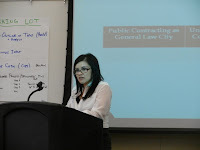 While most speakers were those who regularly participate in municipal matters - speaking before the City Council and commissions, participate on committees, etc. - there were quite a few new faces in the audience. At least a third of the audience were newcomers and they followed the proceedings intently. That's a good sign - the goal of this particular meeting was to lure families out so they could participate in the extremely important process. It succeeded. for example, in the back row of seats, not too far from where I was standing, a new father sat cradling his month-old baby, listening to the discussion, while his wife was on the lawn a few yards away with their other children getting ready for SpongeBob. The topics of concern to the speakers ranged far and wide. Several were concerned about diminishing open space, high density housing, traffic, affordable housing and inadequate parking. 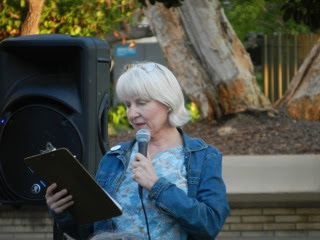 Several speakers spoke in glowing terms about their Westside neighborhoods and expressed the view that there is nothing wrong with that part of town - and that is should be left alone. Considering the fact that this meeting was aimed at families, I don't recall anyone speaking about the need for more sports fields, although many did express a view that they loved the parks - Fairview Park in particular - and hoped features like the model trains would always remain. A few people spoke about the Banning Ranch project - none in favor of it. 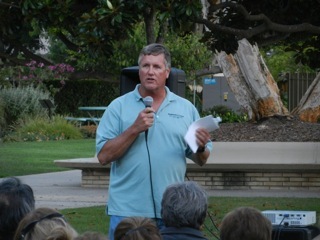 Dr. Terry Welsh, President of the Banning Ranch Conservancy, waited patiently to speak, then did so with vigor and passion. A few spoke with concern for the future of mobile home parks in the city - a valid concern, since there has been a recent movement to shutter a couple more of them and build "new" things in their place. 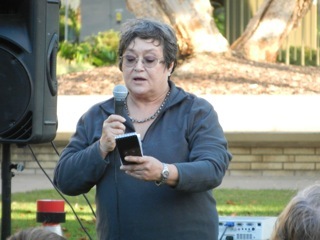 Several speakers opined that mobile home parks represent much-needed affordable housing in Costa Mesa. 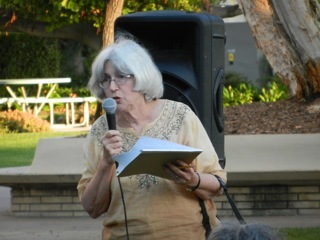 Mary Ellen Goddard spoke about the need for more library facilities and another speaker echoed her comments, but expressed the view that the City shouldn't be on the hook for the costs. 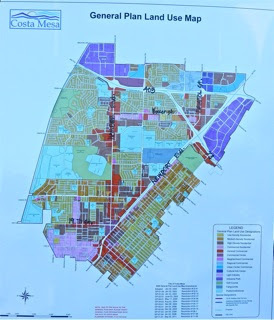 Some of the speakers expressed favorable comments about the industrial/commercial section of the Westside and hoped it would not be forced out and replaced by high density housing elements. 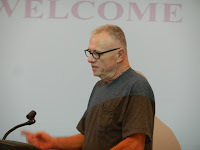 Activist Robin Leffler expressed the need for MORE such meetings, and echoed former councilman Jay Humphrey's view that the "mix" of meetings should be adjusted to include more "land use" meetings and fewer "circulation" meetings, since circulation is driven by land use. The number of speakers surprised the facilitators, but they let everyone who wished to do so to speak their piece, regardless how long it might have taken them. 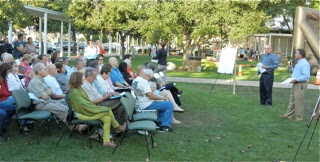 That stretched the meeting until shortly after 8 p.m.
Mayor Jim Righeimer spoke to the group near the end. He regaled us with his busy schedule - meeting with potential developers of "sit-down restaurants", attending the Concerts in the Park, before coming to this meeting. He expressed gratitude to all attending and encouraged them to continue to be involved in the process. Following the outdoor portion of the meeting the kids and their parents were treated to corndogs and other treats while the movie played. Many members of the audience joined Armstrong and Zimmer in the Emergency Operations Center (EOC) where more questions were asked and views stated. Approximately 20 residents took advantage of that opportunity to further discuss the General Plans and give their views for another 90 minutes. I came away from this meeting with strong positive feelings. It was great to see so many new faces taking time to participate. And, it was refreshing to watch the facilitators actually listen to what was being said. Later some of the participants wondered what the outcome of this process would be. They were concerned that all the time taken by them and others to present their views might be ignored by the City Council when the final General Plan document is created. Sadly, nobody was able to placate their concerns. In addition to Righeimer making a cameo appearance during his busy schedule, council women Wendy Leece and Sandy Genis were present at the event. They stuck it out to the bitter end and were still chatting with participants when I left at 9:30. 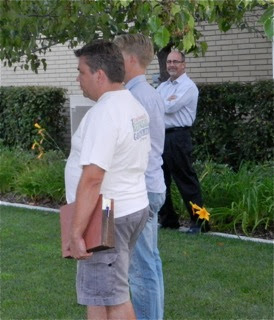 I also saw Planning Commission Chairman Jim Fitzpatrick, Vice Chair Rob Dickson and member Tim Sesler hovering around the perimeter, listening to the proceedings. Now, some of you might say Fitzpatrick was just there for the corndogs, but he seemed tightly focused on the discussions and took time to visit with participants before and after the event. I did see him near the corndogs, though. In addition to several other hardworking city staffers in attendance to help make the event a success, I saw CEO Tom Hatch standing in the back, taking it all in. He was pleased with the turnout and the way the meeting went. 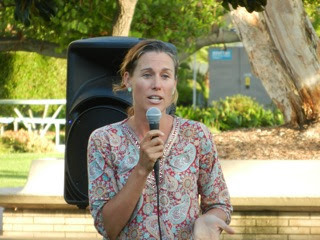 Wednesday, August 21, 2013: Land Use Alternative workshop, 6 to 7:30 p.m., City of Costa Mesa Emergency Operations Center (EOC) 99 Fair Drive, Costa Mesa. Wednesday, September 18, 2013: Circulation Element Workshop, 6 to 7:30 p.m., City of Costa Mesa Emergency Operations Center (EOC) 99 Fair Drive, Costa Mesa. Wednesday, October 16, 2013: Circulation Element Workshop, 6 to 7:30 p.m., City of Costa Mesa Emergency Operations Center (EOC) 99 Fair Drive, Costa Mesa. Wednesday, December 18, 2013: Policy Review Workshop, 6 to 7:30 p.m., City of Costa Mesa Emergency Operations Center (EOC) 99 Fair Drive, Costa Mesa. My next meeting is tonight, Wednesday, July 24th in the Emergency Operations Center (EOC), where the Charter Committee will meet again beginning at 6:00 p.m.. They will discuss Public Contracts if they can get past the "Moment of Silence" issue. You can read the agenda for that meeting HERE.